āparōkṣita gāyatrin tapō rūpēṇa tiṣṭhasi..
Prostrations to Viśvāmitra who gave us the imperishable Gāyatrī Mantra, who has a great pride like a huge fire and who is extraordinary in performing penance! Anger, pride, arrogance and ego are obstacles to realize the Supreme (God). The life of the legendary sage Viśvāmitra serves as an example of overcoming all these and conquering one’s mind and senses to attain the Supreme. Unlike other sages, Sage Viśvāmitra was never a sage himself. He was in fact a king, a Kṣatriya (a warrior) by birth, who obtained the status of a Brahmaṛṣi by performing severe austerities for thousands and thousands of years*. There were times when he had been put through several tests by the Devas, yet his spirit remained undeterred. And there were times when he had to face endless hurdles while he was performing intense austerities, but he overcame all of them to attain the status of a Brahmaṛṣi. The foremost of the sages revealed Maṇḍala (part) 3 of Ṛgveda. He also revealed the Gāyatrī Mantra, the greatest of all the Mantras. The Vedas talk about his glories of being a righteous king who was engaged in the welfare of his citizens and who went to the forest to practise penance for thousands of years. 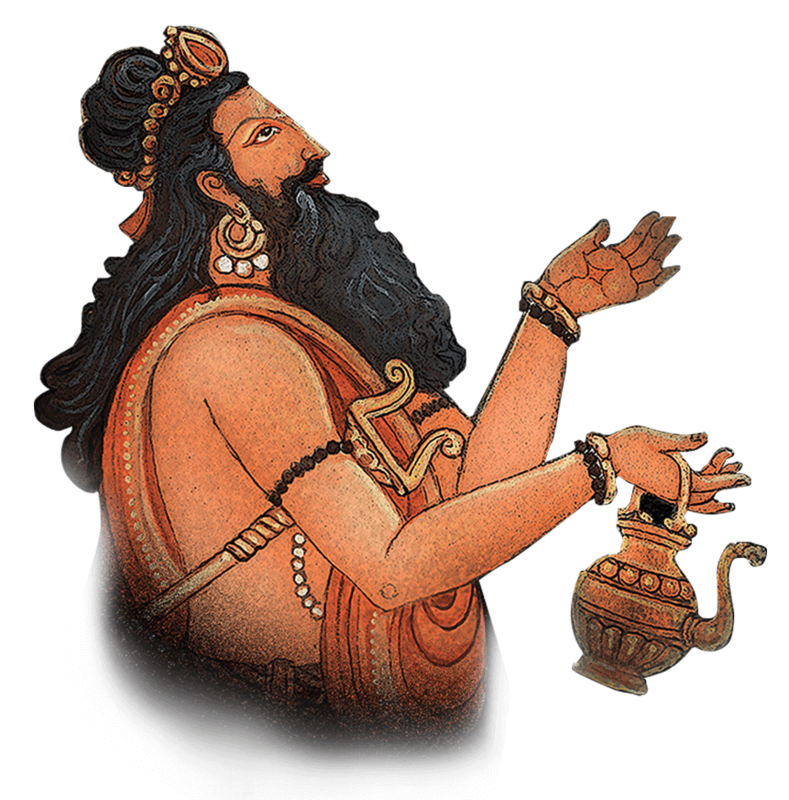 The famous epic Rāmāyana declares him as the personification of austerities and an embodiment of righteousness. It was Sage Viśvāmitra who took both Rāma and Lakṣmaṇa to his hermitage and taught them the art of weaponry. He knew that Rāma was an Avatār (incarnation) of Lord Viṣṇu who came to the earth to destroy Rāvaṇa and uproot the other evil forces that were tormenting the beings in the world. And, it was with the help of Rāma that he was able to destroy the demons who were disrupting the sacred rituals that he and the other sages were performing in his hermitage for the welfare of the beings in the world. Sage Viśvāmitra was known for his perseverance and dedication by which he obtained the status of a Brahmaṛṣi. Before becoming a Ṛṣi, he was a king named Kauśika who was known for his valour and power. As a king, he ruled over the earth for many years and was ever dedicated to the service of his subjects. The kingdom flourished under his rule. What then made him renounce everything and retire to a forest to undergo penance for years? It was his enmity with the prominent sage Vasiṣṭha that led him to undertake such a big mission, for the king wished to possess all the powers that Sage Vasiṣṭha had acquired by practising austerities for years. It all happened when the king embarked on a journey with his army and arrived at the hermitage of Sage Vasiṣṭha, which was adorned with vibrant flowers and creepers, where the chants of the Vedic hymns reverberated in the air and where ascetics were performing intense austerities. The greatest of the warriors and his men were treated with immense hospitality by the revered sage Vasiṣṭha. They were all provided with a sumptuous meal with all kinds of dishes. The king was astounded by the magnificent feast that fed everyone, and he inquired the sage how he was able to feed them all. Sage Vasiṣṭha told him that it was all possible because of the cow that he had received as a gift from Lord Indra. The holy cow, Nandini, could grant everything that one desired. When Viśvāmitra heard that, he was overcome with an intense desire to possess the cow. Hence, he requested Sage Vasiṣṭha to grant him the cow; he claimed that as a king he had the right to possess the cow. When Sage Vasiṣṭha refused to part with the cow, Viśvāmitra tried to take her with him forcibly, but in vain. A battle ensued between the two of them in which Viśvāmitra’s forces were destroyed by the divine powers of Sage Vasiṣṭha. By the end of the battle, Viśvāmitra lost his charm and splendour and resembled an eclipsed sun. Entrusting his only surviving son with the duty of kingship and instructing him to govern the world with righteousness, he went to the forest on the slopes of the Himalayas and began practising austerities there to propitiate Lord Śiva who would bestow upon him the knowledge of the Dhanur Veda (the science of archery) and all the weapons that the celestials like Devas, Dānavas, Yakṣas and Gandharvas use. Upon acquiring the boon from Lord Śiva, Viśvāmitra was overwhelmed with pride. He then decided to confront Sage Vasiṣṭha again with all the powerful weapons that he received as a boon, but he was defeated again as Sage Vasiṣṭha’s staff neutralized the effect of all his weapons. By then, he realized that the power attained by performing austerities is far greater than the power that a king possesses. He decided to perform austerities again to conquer his mind and senses in order to become a Brahmaṛṣi like Sage Vasiṣṭha. For thousands of years, he lived only on fruits and roots, performing intense austerities. Pride and ego would not leave him still as he challenged Sage Vasiṣṭha yet again with the divine powers he had acquired by the austerities that he performed. He unleashed curses upon those who interrupted his penance and who challenged his powers. His anger and fury deprived him of the strength of his austerities and he realized that he had failed to conquer his senses. He then resolved to never give in to anger again and unleash curses upon anyone, and began performing austerities for a thousand years. He had difficulty conquering his senses, but he remained steadfast in his austerities. Seeing his indomitable spirit, the Devas sent Menaka, the best of the Apsaras (celestial women), to the earth in order to test him. The sage at first was infatuated by love when he saw her and lived with her for ten years, after which he sent her back to the heaven, realizing that it was all a trick by the Devas to test his devotion. He continued with his penance. He acquired the titles of a Ṛishi, a Rājaṛṣi and a Mahaṛṣi one by one after performing years and years of penance, but he wasn’t satisfied with them. His mission was to acquire the title of a Brahmaṛṣi, for which he observed a vow of silence for a thousand years more to conquer his mind and senses. He overcame all kinds of hurdles to attain the title and eventually he did. It was Sage Vasiṣṭha who bestowed upon him the title. And since then, the legendary sage was ever engaged in the welfare of the beings in the world. * From the period of the creation of the universe through to the period of dissolution, everything that exists in the universe slowly deteriorates after each and every Yuga, including the lifespan and the capacities of the beings. In Satya Yuga, the lifespan of a human is around one-hundred thousand years; in Tretā Yuga, it is approximately ten-thousand years; in Dvāpara Yuga, it came down to one thousand years, and in Kali Yuga, it reduced to hundred years. Sage Viśvāmitra belonged to the Tretā Yuga, which is why he was able to perform penance for thousands of years.